With 'Laurie Simmons: Big Camera/Little Camera' now on view at MCA Chicago, Phillips' Carol Ehlers caught up with the museum's senior curator to discuss the ongoing power and relevance of the artist's work. 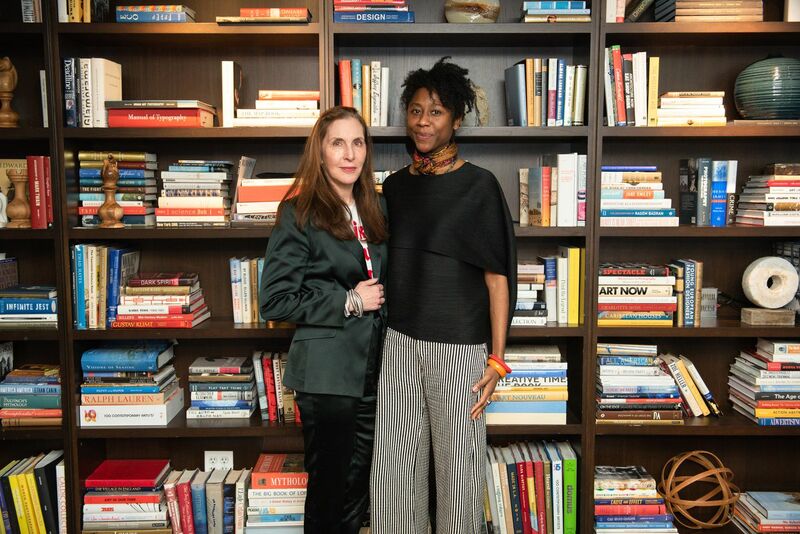 Laurie Simmons with Naomi Beckwith. Photo: Griffin Lipson. Up through Sunday 5 May at MCA Chicago, Laurie Simmons: Big Camera/Little Camera presents a major survey of the artist's work—exploring themes of image culture and subverted gender archetypes through photography, sculpture and film—that spans her whole career. The show was originally curated by Andrea Karnes for the Modern Art Museum of Fort Worth before MCA Senior Curator Naomi Beckwith organized its presentation in Chicago. 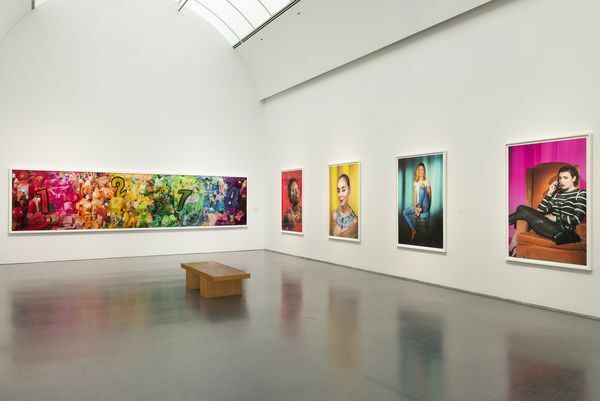 Carol Ehlers, Phillips' Regional Director, Chicago-Midwest and Photographs Specialist, spoke to Naomi about her vision for the exhibition and how it's evolved her approach to Simmons' practice. Installation view, Laurie Simmons: Big Camera/Little Camera, MCA Chicago February 23 - May 5, 2019. Photo: Nathan Keay, © MCA Chicago. CAROL EHLERS: Tell us about the Museum of Contemporary Art and how your current exhibition Laurie Simmons: Big Camera/Little Camera fits the guiding principles of the museum's vision. NAOMI BECKWITH: At 50 years young, the MCA Chicago has always been an early champion of work that doesn't fit comfortably within prescribed genres of art. Its early shows included dial-in art by Yoko Ono, a complete deconstruction of the building by Gordon Matta-Clark and Chris Burden willing to die as part of a performance. Today, it's a vibrant museum with dozens of exhibitions, stage performances and public programs each year. Not to mention a lovely campus of an award-winning restaurant and fabulous plaza and sculpture terrace for relaxing during Chicago's short, but sublime, summer. 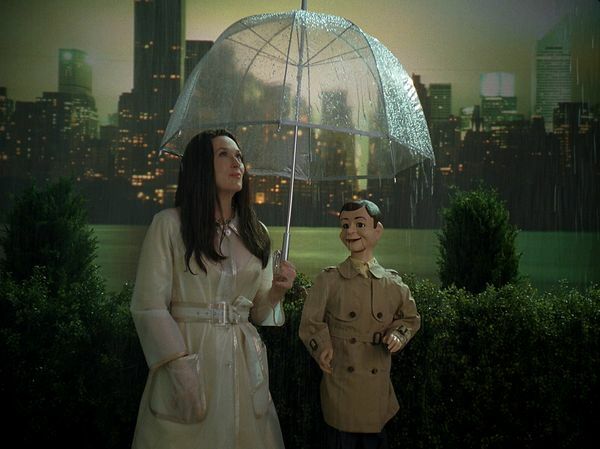 Laurie Simmons' exhibition is a great example of the MCA growing up with an artist. When Simmons first appeared in the art world, her works were fresh but also strange: they were photographs but completely staged, depicting somewhat surreal scenes unlike anything seen in the art world before. Now, audiences take such things for granted, so much so that it was time to show our visitors (and the world) the origins of the contemporary visual culture they may take for granted. We were so happy to host a major show for this groundbreaking artist who hasn't had a major show in quite some time. 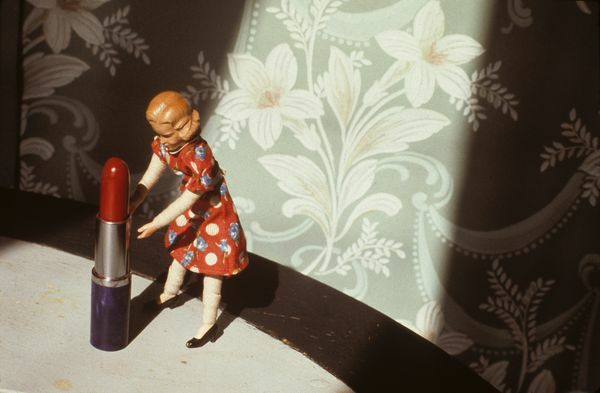 Above from top: Laurie Simmons Pushing Lipstick (Spotlight), 1979. Photo: © Laurie Simmons, courtesy of the artist and Salon 94. Brothers/Horizon, 1979. Photo: © Laurie Simmons, courtesy of the artist and Salon 94. CE: You have described yourself as a "feminist historian" and wrote your master thesis on Adrian Piper and Carrie Mae Weems — two artists whose work addresses society's gender and race-based privileges and assumptions. 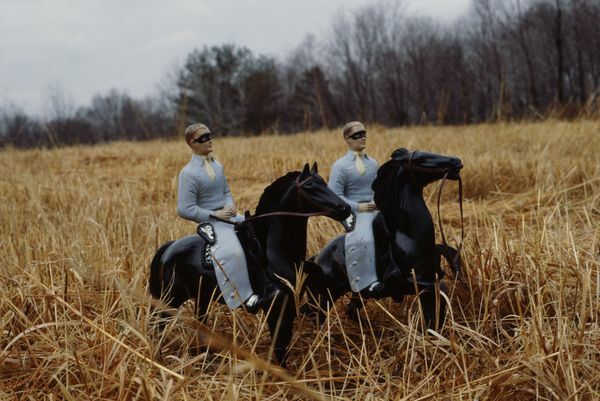 How would you place Laurie Simmons' work in the history of feminist art? NB: Interestingly enough, Simmons doesn't consider herself a feminist artist. While she has no problem identifying as a feminist politically, she doesn't think of her work as part of a feminist tradition. This is a function of a generational perception, I believe. In the early days of Simmons' career, many artists were founding all-female collectives, doing art that looked like "women's work" (craft, sewing and even cleaning), or doing work with or about female bodies. This was quintessential "feminist art," in Simmons' mind, but this is not the sort of work she does. But I think Simmons was an important part of a mass influx of powerful women artists in the art world beginning in the 1970s. These women were ambitious, had singular ideas in their work and wanted to change the demeanor of the art world. This is the kind of feminism that has been important for me and my work. The world is still fascinated by the differences between images and 'real life', It's as if Simmons pre-figured Second Life and a world totally captivated by Instagram. Laurie Simmons. Photo: Josh Mathews. CE: When did you first encounter the work of Laurie Simmons? And how has your understanding of her practice changed since working on Big Camera/Little Camera? NB: I first learned of Simmons' work as a student when she was introduced to me as a feminist photographer who made images that critique traditional women's roles in society. It was all quite trippy and magical. She was part of a group of artists, like Cindy Sherman, Louise Lawler, Martha Rosler and so many more, who started to tear at the veneer of machismo and heroic painting in the 1980s art world. But, while working with Simmons, she corrected me on two major points: she is neither a feminist artist nor a photographer! Simmons is very careful to say that she is an artist and filmmaker who works with the camera. Besides this, I also came to realize that her work is so much more than a critique of feminism—it is a close look at all gender roles and, more specifically, any role we're privileged to adopt as American consumers. We've been able to buy the life we want since the post-WWII boom, and Laurie is fascinated by both the joy this engenders and the sometimes sinister effects this can have on our psyches and our environment. Laurie Simmons The Music of Regret, 2006. Photo: © Laurie Simmons, courtesy of the artist and Salon 94. CE: Woman photographers have played a major role in the history of Contemporary art. Why did Laurie Simmons choose photography to make her images? NB: Simmons wasn't trained as a photographer but was part of the first generation of Americans raised on images in magazines, movies, television and in advertisements. So, when she—and others of her generation—wanted to make images, it was almost natural to look for inspiration in the images in the culture around them. For Simmons, that meant recreating those artificial worlds on miniature sets that she could shoot like a film set. Since photographic technology was getting easier to use, artists could begin to document the world and their creations in unique and compelling ways. 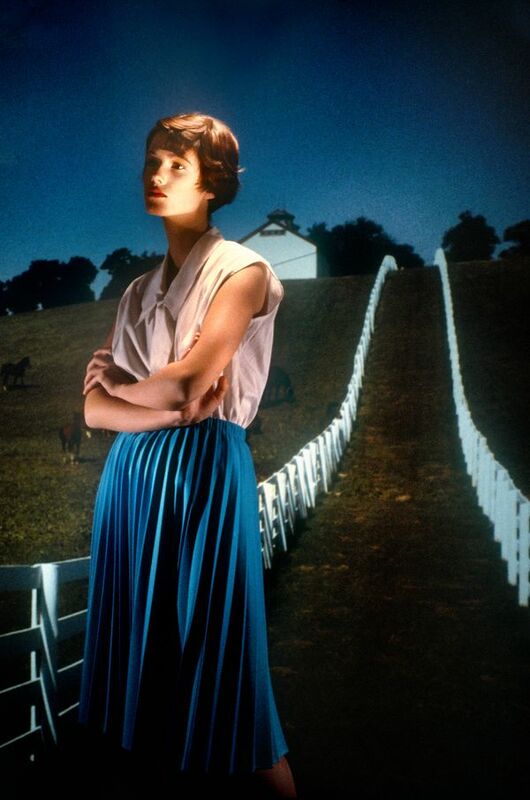 Laurie Simmons Country Road: Kentucky, 1984. Photo: courtesy the artist and Salon 94, © Laurie Simmons. CE: Walking through Big Camera/Little Camera, I was struck by how relevant the work is today. Would you address what is it about the public consciousness of the late 1970s and 80s that is similar to the one in which we live today? NB: The world is still fascinated by the differences between images and "real life." It's as if Simmons pre-figured Second Life and a world totally captivated by Instagram. Simmons is unique in that she treats that fascination with loving ambivalence: she isn't mad at consumer culture; she quite enjoys participating in it. She enjoys taking on traits ascribed to women, though she knows they can be used against us. She loves shiny, colorful plastic objects, though she's convinced they will ruin the planet. Simmons remains relevant because she is so honest and playful about our wealthy, Western world: we have the ability to build our life or we can narrate a story about our lives, and sometimes it doesn't even matter if those are one and the same.